Since NonFungible.com’s inception, the platform has been growing rapidly and changing every day. Our goal of creating an NFT marketplace that crypto beginners can understand has morphed into creating an all encompassing future CoinMarketCap of non-fungible token assets. NonFungible.com began as an idea for an NFT marketplace. While on the hunt for a domain name, I immediately found that NonFungible.com and other variations were available and scooped them up quick. As an avid domain hodler and NFT supporter, I saw the immense opportunity with these names. 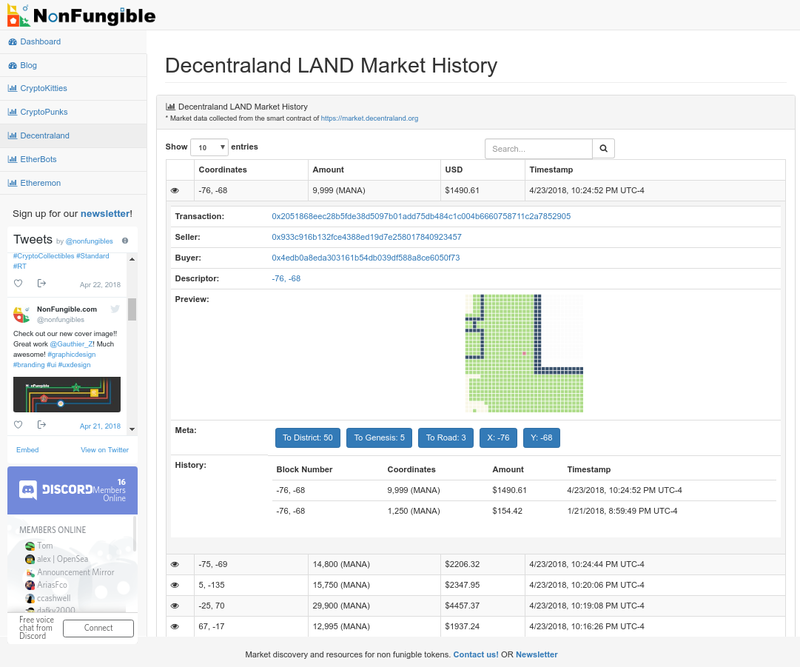 As soon as I purchased NonFungible.com, I began coding a LAND marketplace smart contract. After countless late nights, I finally finished the smart contract. Once the hard work was finished, I needed to create a beautiful user interface. A few days after I implemented our basic user interface prototype, Decentraland announced they were releasing their official LAND marketplace. Additionally, when I started to run with creating an NFT Marketplace, I found other projects like Project Wyvern (https://www.projectwyvern.com/), RareBits (https://rarebits.io/), OpenSea (https://opensea.io/). I decided it was best to re-group and find a new entrance niche. Fast forward a few weeks later and there was another opportunity, historical pricing for LAND within one unified interface. I have been involved in the Decentraland community as a district leader, statistics and tool writer to help the community. Additionally, I have helped support users with their difficult questions in the community chats and helped to build the initial prototype for EthAlarm as well as collected a few bug bounties. With all of this Decentraland experience, I decided that NonFungible.com was a logical transition for me, and thus, it was born! Mission Statement: Organizing the infrastructure making fair asset ownership universally accessible. Vision Statement: Helping crypto-beginners and experts alike understand and discover the opportunities within the non-fungible digital asset (NFT) ecosystems. NonFungible.com supports the use of non-fungible tokens (NFTs) as a means to achieve truly fair asset ownership. Built on top of blockchain technology to provide desirable decentralized, censorship resistant, immutable properties. Similar to how Bitcoin is the answer to financial ownership and independence, non-fungible tokens are currently the best solution to fair asset ownership. Supporting the market with analysis and discovery tools is the just beginning of creating a healthy non-fungible ecosystem. A nice side effect of the market data is that we are also providing greater transparency with the data. We have gotten rid of the need for a programmer to understand and do analysis on the data. We hope to help facilitate the ride and become a key resource in the industry! After quickly deploying an Ethereum node and creating a blockchain event monitor, I set up a simple website with historical market data for Decentraland. The community support from this initial launch was phenomenal. I am so humbled by the amount of positive support! I quickly got to work implementing CryptoKitties, CryptoPunks, Etheremon and Etherbots, only to find out that a Parity “fast sync” isn’t going to cut it. Seller information and/or purchase price were missing in a few scenarios. After a little research, I found that I would have to sync a full, unpruned Ethereum node with tracing enabled. This can take a week or longer and requires robust computer hardware and 1 TB of SSD disk space. Whoah! This is not as simple as I was hoping, after setting up some rather powerful temporary servers, the new sync began. We needed to complete the functionality, support a broader community and most importantly, gather all the data for a range of non-fungible projects. For that, I needed time to code but also had to wait for the Ethereum node to fully sync up with the network. I took the week of April 9th off from my day job to focus on NonFungible.com. I’m extremely pleased with NonFungible.com site developments, code, community support and potential revenue streams. With the v2 prototype launch, we officially launched the remaining 3 planned NFTs, gathered the meta data, provided a little more robust searching (still a bit of optimizations to go here), and added USD conversion prices using CoinMarketCap historical open prices. The USD price for historical data before April 18th uses the daily open price. Everything going forward uses the price regularly updated from CoinMarketCap. Aside from our new, but wickedly successful medium blog, we’ve been working with the NonFungible token community and are in touch with leaders, admins, mods and devs via Discord. Our Discord channel aggregates the news from the non-fungible token projects’ Twitter and Discord announcement channels so our users can easily get their news in one unified interface. We have also begun creating an NFT Network for the professionals involved in these NFT projects. We hope to help accelerate their growth and accommodate collaboration within the ecosystem. We have a number of features on our roadmap that are sure to add more value to the platform which we will be proud to call our official MVP. With the MVP, we should have a strong basis to create sound revenue streams from. Below is a summarized and tentatively ordered list of our current priorities feature-wise. Thank you for being a part of the non-fungible revolution and for your support with NonFungible.com! Follow NonFungible.com’s Medium Publication: here. Subscribe to the NonFungible.com Newsletter: here. Join NonFungible.com’s Discord server: here. Follow NonFungible.com on Twitter: here. Follow NonFungible.com on InvestFeed: here. Analysing the non-fungible token markets, crypto-gaming ecosystem and blockchain marketplaces. Reviewing games, analysing datas, explaining the upcoming revolution.